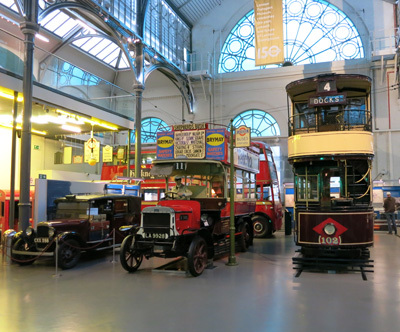 In 1920 the London General Omnibus Company (LGOC) nominated a single bus to represent the contributions of their bus drivers and mechanics who played such an important role during the First World War. The chosen bus was B43, later known as ‘Ole Bill, after a famous wartime cartoon of the same name. Built in 1911, B43 was one of the first London buses requisitioned for the war effort and saw action along the Western Front, in Belgium and Northern France. One of only 240 B-Types to return from France, B43 was refurbished by the London General Omnibus Company (LGOC) in 1919 and put into service as a Traffic Emergency Bus, on routes 8 and 9. 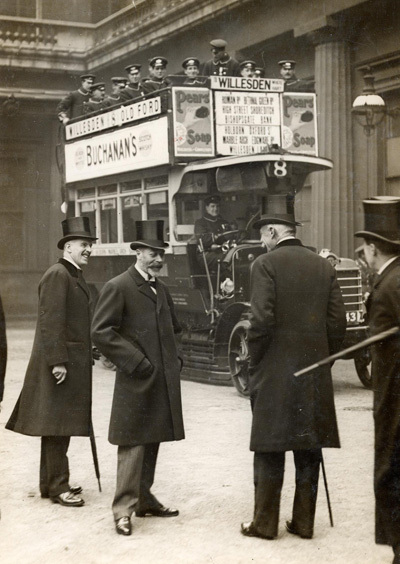 On 14 February 1920, the bus was inspected by King George V at Buckingham Palace, becoming the first time the King had boarded a bus. The LGOC staff magazine – Train Omnibus Tram (TOT) – dedicated four pages to the event and it received wide press coverage. Thirty-five LGOC drivers were carried as passengers into the courtyard of the Palace where they were congratulated by the King. As well as the drivers, a number of high profile public figures also attended, along with Lord Ashfield, the chairman of the Underground Group that owned the LGOC. After the King’s inspection, a brass representation of the celebrated cartoon character ‘Ole Bill was attached to the B43’s radiator, along with a name plate and a plaque recording the major battles it was associated with. ‘Ole Bill was created by cartoonist Bruce Bairnsfather in 1914-15, depicted as an elderly, pipe-smoking ‘tommy’, complete with a walrus moustache. The cartoons were sometimes controversial, but always extremely popular during the war, raising morale for the troops with ‘Ole Bill himself even starring in his own West End musical in 1917. ‘Ole Bill appeared in the first Armistice Day parade in 1920, and for many years afterward, with a group of surviving LGOC men, as well as special events and funerals for fallen soldiers or LGOC employees. After leaving public service in 1924 ‘Ole Bill was maintained as a kind of mobile war memorial by the wartime busmen’s ‘old comrades’ association. On May 5 1970 Ole Bill was presented to the Imperial War Museum driven by a veteran. It remained on display there for more than thirty years. As part of London Transport Museum’s Goodbye Piccadilly – From the Western Front to the Home Front exhibition, which focuses on the role of London’s transport during the First World War and the effect of war on the Home Front , ‘Ole Bill will appear at the Museum next to a B-type bus which already resides within the Covent Garden collection. Previous PostOn this day in 1956: The first ever Routemaster enters serviceNext PostWhat’s in a number?